Hello guys, apakah kamu sedang mencari contoh percakapan yang digunakan sebagai seorang buttler dengan menggunakan bahasa inggris? ya tempat yang kamu tuju sudah tepat, berikut ini saya berikan contoh percakapan yang kamu cari. Percakapan buttler service ini digunakan saat praktek disekolah ataupun pada saat ukk. Untuk tema bisa disesuaikan, karena disini kasusnya adalah guest (tamu) meminta penambahan extra bed dan ada yang meminta spoons, forks, and glass wine. 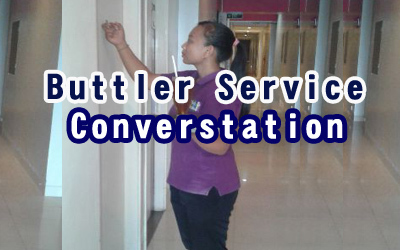 Baik biar tidak terlalu lama ceramahnya, langsung saja lihat dibawah ini Contoh percakapan Buttler Service - Buttle Service Converstation. Butler : Good morning Mrs. Thalita, I’m from butler service, I bring your request there are 4 spoons, 4 forks, 4 glass wine. Where must I set up this Mrs. Thalita? Mrs Thalita : Please you set up in my dining room. Butler : Certainly (set up 4 spoons, 4 forks, 4 glass wine). Excuse me, I have finished to set up this. You can enjoy your day tonight. I hope you memorable stay with us. Do you ned something else? Mrs. Thalita : No, this is more than enough. I like it. Butler : Can I take your signature for guest item? Butler : Thank you so much for complete the information Mrs. Thalita. Have a nice day. Mrs. Thalita : You’re welcome. Butler : Good morning Mrs. Thalita, I’m from butler service, I bring your request there are extra bed and guest supplies completed. May I set up the extra bed for this time Mrs. Thalita? Mrs Thalita : yes, I want you set up now. Butler : Certainly (set up the extra bed and other aminities). Excuse me, I have finished to set up this. You can enjoy your day tonight. I hope you memorable stay with us. Do you ned something else?